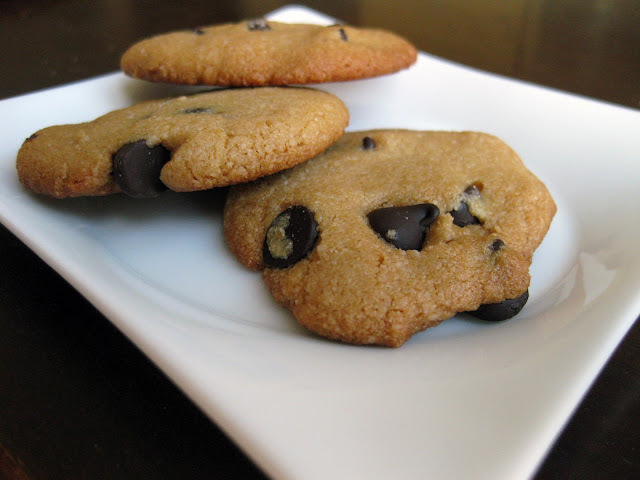 Picture of the BEST paleo chocolate chip cookie recipe out there. After an exhausting baking and taste testing of six paleo chocolate chip recipes several weeks ago (that post is here), I set out to perfect a paleo chocolate chip recipe of my own - one that would hopefully offer a "less unhealthy" alternative to traditional chocolate chip cookies, but best match their flavor and appearance, using ingredients from the paleolithic diet. The result? Read on! As a starting point, I used a recipe closest in taste and appearance to a traditional chocolate chip cookie (Recipe #6 of my Paleo Cookie Recipe Comparison). Tasters of the original Recipe #6 griped about the oiliness, sweetness, and flavor of the oil, so I began testing changes to the recipe. 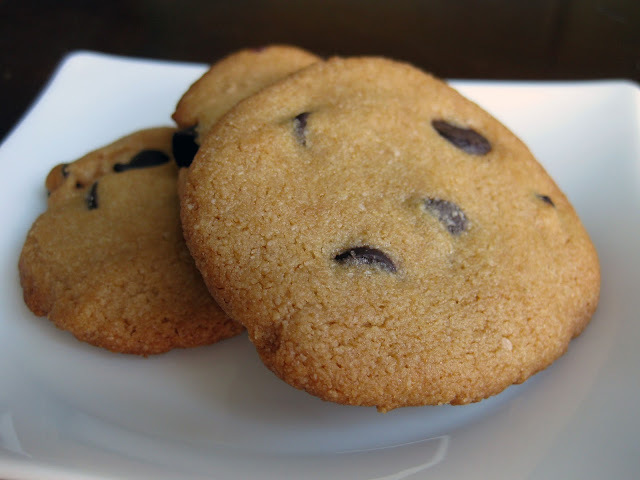 BakerGal's delicious paleo chocolate chip cookie recipe! I made about 15 different batches, using each one to experiment with different sweeteners, oils, other ingredients (almond nut butter, cashew nut butter, hazelnut flour), and ratios until my taste testers and I were satisfied. For oil, I steered away from non-paleo options (canola oil, vegetable oil) and from paleo options that would introduce non-traditional flavors to my cookie (olive oil, coconut oil, walnut oil). Eventually, I settled on macadamia nut oil. Macadamia nut oil is rich and smooth with a pleasant flavor that doesn't interfere with the dominant cookie flavors. To sweeten the batter, I tested batches made with agave syrup, raw honey, and a homemade paste of dates. Extra dark chocolate chips helped temper the cloying sweetness tasters found unappetizing in the original recipe. I knew I had succeeded when one taster wandered through the kitchen, nabbed a cookie and ate it without realizing it was paleo. In the process of making so many batches, I learned a few things that are important for the success of this cookie, including sweetener substitutions and measuring almond flour. I've noted these in the recipe notes of the final recipe below. A scant 1/4 cup dark chocolate chips. I used Guittard Extra Dark chocolate chips (63% cocoa and incredibly smooth). Using a darker chocolate (for example, the Guittard 72% Cacao Baking Discs ) will make the cookies less sweet. Mix almond flour, salt, and baking soda well. In a small bowl, mix agave nectar, Macadamia nut oil, and vanilla. Combine wet and dry ingredients, mixing well. Add dark chocolate chips. Batter should be thick enough that you can roll a small ball between your palms and set it on the cookie sheet without it drooping or losing shape (see notes). Make 16 - 20 small balls of paleo chocolate chip cookie dough and space them evenly on a cookie sheet lined with parchment paper. Press the cookies down as flat as possible with the palm of your hand. This is important! The cookies will NOT spread out on their own. Bake about 6 minutes. Watch closely and remove when the edges start to brown. . . they could be done at 4 minutes or at 8 minutes depending on the size of the cookie and your oven calibration. The brand of almond flour you use is important because you want a flour that is very finely ground, and this quality varies greatly across brands. Bob's Red Mill almond flour is not finely ground enough - I did a test batch and the cookie batter is too runny and ends up ugly with a grainy texture. Honeyville Farms (link goes to amazon) is the brand I used for the cookies pictured above and would recommend. If you can't find Honeyville Farms almond flour or macadamia nut oil, you can follow the links in the post to Amazon to purchase it, or you can visit the "store" section of the blog, where I've provided links to purchase them. Measuring the almond flour by weight is much more precise than measuring by volume, so use a digital scale if you have one. Trying to measure almond flour by volume can lead to over- or under-measurement: if it is too packed or too fluffed-up you fit too much or two little of it into your measuring cup. If you don't have a scale and have to measure by volume, then do your best to gently spoon the flour into the measuring cup and level it off with a straight-edged knife. As a rule of thumb for this recipe, you should be able to roll the finished paleo chocolate chip cookie dough into a ball between your palms, and when you set it down it should keep its shape. Add a little more almond flour if it doesn't pass this test. Raw honey: It works just as well. I tried a batch that turned out looking almost identical, feeling a little bit chewier, and tasting faintly of honey. Date paste: If you prefer "whole sugars" that come embodied in their originating fruit, I also tried a date paste that worked but yielded a slightly wetter cookie with slightly less traditional flavor. To make a date paste substitute, take 8 pitted dried dates and chop them very finely. Add 1/4 cup water to the chopped dates and heat in a pan or microwave, stirring frequently until they've softened and absorbed some of the water (about 30 seconds in the microwave, stirring every 10 minutes). Add water as needed to keep them hydrated and jam-like in consistency. Remove from heat and mash the dates as thoroughly as possible with a fork. Add another few teaspoons of water if needed and heat again briefly to further soften the mixture. Place the paste in a measuring cup. If you don't have 1/4 cup of date paste, add enough water to bring the mixture up to the 1/4 cup line. Proceed with recipe as written. It has a long unrefrigerated shelf life, but doesn't often fly off the shelf at your local supermarket, so those bottles may have been there for a while. Be sure to select a fresh bottle. Damn those cookies look good! PS - Is tofu on the paleo diet? I'm hosting a giveaway so check it out if you're interested! Mark - Thanks! Hope they turn out for you! Elina - I found macadamia oil at my local Whole Foods, so that's worth a check. Definitely call around before heading out to shop, though. Tofu and soy products aren't paleo, since they are made from a legume (soy beans). Elina - In case you can't find any macadamia oil near you, I added a link to it through Amazon.com within the ingredients section of the recipe (you'll see "macadamia nut oil" is blue and underlined...that will take you to the product page). Luckily, I didn't have to eat them all myself! I had many hungry volunteers who helped them disappear. :) Good luck with the Bob's Red Mill almond flour...like I said, they won't look as nice and will also taste grainy, but I have tried it and it works. The only almond meal held around here that I can find is Bob's, or Trader Joe's. Do you know of any other more finely ground almond meal/flour brands? Hi Lindsey! Yes, Honeyville Farms Blanched Almond Flour is the right consistency. You could try calling your local healthfood store to see if they offer it, but I've provided a link in the "Store" section so that you can buy it from Amazon! Hope this helps! Whoops! I meant to say, "Other than the Honeyville brand." Well, everyone, I used Bob's (made the cookies for tomorrow, didn't have time to order :S) and it the batter was very runny and difficult to handle. The cookies spread out pretty far and when I took them out, they were giants kissing each other. But, aside for the inevitable grainyness, they're still absolutely delicious. Closest substitute I've had yet. Awesome recipe. I made these tonight and they were DELICIOUS!! I used honey instead of agave and walnut oil instead of macadamia because it's what I had on hand and I was impatient to try this recipe! my almond flour was not as finely ground as you suggested, but we didn't mind the texture. I'll try it again as written sometime, but am thrilled with my tasty treat tonight! Just baked these for the first time - I actually had to order the macadamia nut oil and the almond flour online. My non-Paleo husband thought they "tasted funny", but o...m...g... I think they are delicious! The only issue I had was that I think there was a drop or three too much in the way of liquid so the dough was sticking to my fingers and the cookies came out a little mushy. It didn't affect the taste, but next time I'm going to mix them up and maybe add a little more almond flour to hold the mixture together. I used 60% cacao chips but want to try something a little less sweet. Other than that, the taste and texture was perfect and they took care of my sweet/chocolate cravings. Very filling! I followed the recipe exactly... Yummy! OMG! I tried these today and the only substitute I made was using coconut oil instead of Macademia oil and they are SOOO good! Thank you so much for posting this recipe. I can't wait to try the brownies. I get to be on paleo and still enjoy treats! AWESOME! OMG! I just made these and the only substitute I made was using coconut oil instead of macademia oil. THey are SOOO good! Thank you so much for posting this recipe I can't wait to try the brownie recipe. I am really glad I can go paleo and still enjoy treats! AWESOME! Oh, and I used NOW almond flour and they turned out perfect no running dough at all. Hey BakerGal! Thanks for sharing this recipe :) I was impatient to try it, and so I was lacking some err... key ingredients (like chocolate chips, LOL) but I made it with Bob's Red Mill Almond Meal/Flour (I know, I know) and coconut oil (yes, I know again) but honestly - I was quite happy with how they turned out, especially since you warned me what to expect! Without the Cchips, and the bit of grittiness from the almond meal, along with the fairly noticable flavour of the coconut oil, they ALMOST had a mouthfeel/flavor of like... a coconut macaroon! Either way, my little boy was mighty pleased to have any sort of cookie (I've been placating him with muffins - he's been pretty good transitioning to this new grain/dairy free lifestyle, but I think he reall misses his "munchies"). Thanks for all the hard work that I know you did trying to figure out the mechanics of this recipe!! I didn't test the limits :) You'll have to use your best judgement there...Too much of any one thing can't be good. Any thoughts on using mashed bananas for the sugar? Hmmm! That is one I didn't think of trying. I know that the date mash works pretty well, but dates are much much sweeter than bananas. I you try it, please report back! My guess is it will make a chewier, thicker cookie that has a banana flavor. Best of luck! Aren't bananas a substitute for eggs, not sugar? Speaking of which, why does the recipe not call for any eggs? Did you try that and they turned out too cakey? Although bananas are sometimes used as an egg substitute, their inherent fructose content should also make them sweet enough to provide some substitution for the sugar called for, validating Rochelle's idea to a degree. To the point of you second question, the base recipe I began modifying did not call for eggs, and since most paleo followers try to limit egg intake, I did not attempt to introduce any to this recipe. Cool beans! Well, since "you're allowed" up to 6 eggs a week, I think I'll try 2 versions; one w/o eggs (following your exact recipe) and one w/ an egg - just to see what it does to texture. The reviews sound very impressive and I can't wait to try it! Just need to hunt down some Honeyville Farms flour. Thanks for going through all that work to perfect a Paleo dessert! Awesome! Definitely check back in and let me know how the version with the egg goes. I'm curious! I see so many "paleo" recipes with chocolate chips these days. Unless you are using 100% chocolate, there is sugar added. There is usually soy lecithin as an additive also. So how is it paleo? Hi Kyle! It is true that it is hard to find good chocolate chips, even if you aren't following a paleo lifestyle. If you are a very strict paleo follower, you can buy unsweetened baking chocolate (ingredients will include only unsweetened cocoa/cocoa liquor) and chop it into small chunks to use - Ghirardelli offers a 100% cocoa unsweetened chocolate baking bar that can serve this purpose. However, without a small amount of sugar, cocoa is quite bitter. In this case, I chose the darkest chocolate chips I could find (meaning lowest sugar content) - Guittard Extra Dark Chips. The label boasts only four ingredients. Unfortunately, this brand does contain a small amount of soy lecithin - and though not at levels approximating eating a serving of legumes, some paleo bakers may choose to use only unsweetened chocolate chunks to avoid the additive. hi! i'm going to try making these right now, but was wondering, do you have any experience substituting xylitol or erythritol instead of the agave? the agave/honey is the only ingredient hubby is a little wary of. he's way stricter paleo than i am. Hi Kristin! I haven't tried using xylitol or erythritol. If you give it a shot, please let me know how it goes! i made them, exactly as per your recipe, but with honey and chopped nuts. my goodness, they are incredible. all your research paid off. they were so much better than the ones i ordered online from a baker. i think you are totally right- the type of almond flour you use is key. the coarser grains just don't absorb the oil nicely, and you get a greasy, grainy cookie. i used JK gourmet brand (off amazon), and it made fluffy PERFECT cookies. i will try with xylitol next, and report back to you. These were great! Thanks for all your work experimenting with recipes and creating your own! I will definitely make these again! These are fantastic! Thank you so much for all your hard work!!!!!!!! I didn't have macadamia nut oil so I used walnut oil and they turned out great! Now I just have to stop myself from eating the whole tray! i wanted to let you know that i tried this recipe with erythritol, and it's great! i used 1/4 c. maple syrup, and added about 4 tbs erythritol to it to match the sweetness of the agave in your recipe. worked like a charm! This is a fantastic recipe; a new favourite. They worked really well with coconut oil in place of the macadamia oil, although I'm looking forward to trying them with the latter when I can get some. For those in Australia, Lucky brand almond meal works great. I recommend buying the unflavoured almond meal if you have allergies, however. Thanks for sharing this wonderful recipe! I used your recipe as a base. I've been eating too many almonds/almond butter/almond flour so I did equal parts coconut flour, almond flour (trader joe's brand) & tapioca flour. Added an egg because of the coconut flour. Wow! So good!! Next time, I'll make it exactly as you have it written. They look so great in the picture! Have you ever tried baking with Chestnut flour? I've just started using it and am curious about your findings. Unfortunately, I haven't tried that yet! If you do, please let me know how it turns out. I hardly ever comment on anything..but these were so good! I had to say thank you for your hard work. My kids are so happy that they got to have cookies!!! They have been doing paleo for almost a month now and these kind of treats help to ease the way. I am confused by the post regarding the Paleo Diet and no eggs. I'm not certain where you received that information, but it is wrong, as eggs are a STAPLE of the Paleo Diet. Now, if you mean the fake eggs that come in a carton, then yes, they are not Paleo. But whole, in the shell, comes from a Chicken, eggs are 100% Paleo. In any case, the recipe does sound delicious and I am excited to give it try. I am wondering if there is a way to add an egg or two to this recipe to increase it's protein content. Thanks for all of the hard work. This is a GREAT recipe! I am posting it to my blog tomorrow, all credit to you, and a couple modifications that I had to do out of necessity. I am going to snag the macadamia nut oil and finer almond flour and make them again. Thank you!! I haven't. If you do, please let me know how it turns out! I just pinned this, these are excellent! I really like the flavor, I usually like the chocolate chip part of the cookie best but these I actually loved the actual cookie! These were great. Even my 6 year old who usually dislikes all my paleo baking loved these! I used coconut oil bc i had it on hand. I am guesing I made mine much larger than you bc I only got 13 and took about 10 mins to bake! But so great. Will do these again and again! I just made these and they were amazing! I used expeller pressed coconut oil, so no coconut flavour. I totally agree that the salt is necessary! It makes them taste more buttery :) I also used 3/4 tsp of baking powder instead of baking soda (I know, not really paleo but I'm out of baking powder, and the baking soda was still in the cupboard!) And I used honey, but without the added water. I also only had the Bob's Red Mill almond flour. I tried running it through the food processor to see if I could get it finer, but I don't think that did a thing! Anyway, they spread out and were super flat (almost like a crepe!) and they didn't rise at all (I'm sure because of the baking powder substitution). Thanks so much for doing all this work to 'optimize' the recipe. I totally sounds like something I would have done before I had kids :) Now with a 2 year old 'helping' with every batch, everything goes a lot slower! lol! I'd been searching for the 'perfect' paleo cookie, and I really think you nailed it! Yay!! I just had to add that I went out and found some better almond flour (JT Gourmet - I live in Canada, and we can't get Honeyville Farms almond flour up here without ordering it online). Anyway, for the Canadians, look for JT Gourmet! I also picked up some baking soda, so I followed the recipe except for substituting coconut oil, and using honey. They turned out SO AMAZING! By far the best paleo cookies I've made/tried. The did spread out a bit, so maybe next time I should weigh the flour. Glad these worked for you! Thanks for sharing your tips for the Canadian readers out there! @ BakerGal - you mentioned using a scale to measure the flour instead of a volume measure.. For accuracy, are you just measuring out the equivelnce of ounces to the cups needed (going from volume/volume to weight/weight) or are you even considering density for an accurate weight. I understand cooking is a science, so I'm curious to know the measurements you are suggesting. I am using the following conversion values: 1 cup of almond flour (volume) is equal to 4 ounces (weight). This is based on almond flour manufacturer suggestions. For this reason, I call for 1.25 cups of almond flour (measured by volume) or 5 ounces (measured by weight). For another material, brown sugar for example, these conversion values would be different: 1 cup of brown sugar weighs about 7 ounces. I hope this answers your question! Just made these and WOW! I have to follow a fairly strict Paleo diet and these cookies were a nice treat. They are the closest you can get to the real thing. My almond meal was not a fine grind but they are still perfect. Thanks for all of the work you put into this recipe. For people like me who can't eat any grains for whatever reaon will find a real treat in these cookies. I've recently stared cooking a few Paleo recipes, trying them out on my boyfriend and surprising him with the fact they are Paleo. I have just baked these cookies and I have to say that they are amazing. After my last attempt at Paleo biscuits (which were very bland and coconuty), I was a little unsure, however I am delighted. I took them to work and amazed everyone! Thank you so much! I may just try your Chewy Brownie too. Great news, Amy! Thanks for letting me know! I made mine with Bob's Red Mill almond flour and olive oil, and they turned out pretty good. However, my taste buds may be off given that I'm paleo. Thank you for sharing the wonderful recipe. I get to be the pain. I have an almond allergy. Is there any substitutions out there? I haven't tried any non-almond flour substitutes, but there's at least one direction I think would be worth trying, and that is other nut-flours. I've seen hazelnut flour at Whole Foods, and there are probably others as well. Grinding a nut flour at home is also an option, but will likely be a poorer consistency than a commercially ground flour. Best of luck...and let me know if you find a good alternative - I'll share it! I tried using coconut oil and raw honey, the honey was too strong in flavor. I just tried the original recipe, but didn't have "raw" agave. It is very good though, I wonder about using coconut palm sugar. How much would I use? Thanks! I agree with you on the honey. Some like it, but I find the flavor distracting when in baked goods that don't normally call for honey. An alternative paleo cookie recipe I've tried calls for about 1 cup of palm sugar for a batch of dough that makes about 24 cookies. Here's how I would recommend proceeding: For the recipe above, I would start with 3/4 cup of palm sugar. Since you will be missing the moisture of the agave syrup, add a small amount of water to the palm sugar until it is moistened, and then mix it in to the batter. If the batter seems too dry and/or doesn't taste sweet enough, add a little more sugar or water, 1 tablespoon at a time, until the dough is pliable enough to form a cookie and it seems sweet enough. Great recipe I substituted macademia nut oil for pure apple sauce. Very Good! Super fast to make and yummy! I used almond oil rather than macadamia nut. The batter was sticky even though I weighed my almond flour so I did use more. It was still sticky and losing a bit of the cookie taste so I put the batter into the fridge for about 30 mind to chill it. Worked great! Thanks for your time well spent in the kitchen! i tried these tonight and they were fantastic! Do you know the nutritional facts on these or the calorie count? I was so impressed with these after baking them! 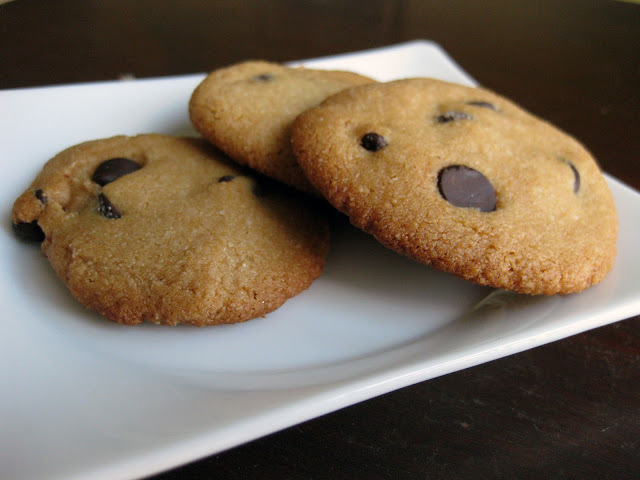 They had that traditional chocolate chip cookie taste that I haven't been able to find with other paleo recipes. Thank you so much for sharing this recipe and I look forward to more great stuff!! I just posted on your comparison on how good recipe #2 was. Now I have to try these!!!! Thanks for experimenting and finding greatness! Aaaaand they turned out absolutely terrible! Note to anyone trying to modify this recipe... while I'm sure that the original recipe is amazing, definitely don't try the coconut flour! Also, the banana made it overpoweringly banana-flavored. However, crumbing the disastrous cookies over vanilla ice cream turned out pretty well, so there's that! Thanks for all your hard work, BakerGal! BakerGal you are actually the best!! I've been trying to find the right healthy cookie recipe for ages, and fiiiiinally yours turned out AMAZING! So happy!!! I finally got the Honeyville Farms flour and I gave these a try. I found that half a cup of agave was too sweet for me... will reduce that to 3 tablespoons next time. They tasted great, but the consistency was an issue... my cookies were really loose and would not stay together. I followed the recipe meticulously. Did anyone else have trouble with consistency? Perhaps I should have just continued cooking them, ie longer than 8 minutes? Alternatively... I might try the idea of rolling them into balls and then baking them. Either way... thanks for this recipe! These were fabulous! I didnt have mac nut oil on hand so i subbed melted coconut oil. Thanks for sharing! I love your approach to testing all the cookie recipes. And I agree with your comments on the almond flour - using finely ground and weighing the almond flour works best. I am looking forward to trying your recipe! These cookies are amazing! I made them last night and hubby and I didn't save any for the kids. Tonight I have a double batch going on so that they can have some too! This recipe could really be trouble for me...I am addicted! ;). Thanks for the best paleo cookie recipe I have tried so far ( I like my sweets)! So glad you like them!! I used to Bob's Almond meal flour as that's all that is available in my area but I put it through my spice grinder just to get the consistency a little finer. I used a mini ice cream scoop to make the shape and they came out great! I am personally not on the Paleo diet but one of my college classmates is and I didn't want to exclude her from the goodies I was bringing in the celebrate mid-terms. Hopefully she is pleased with the results.